Samsung Galaxy Grand 2 is now available for Rs. 18,799 on online shopping. This version of Grand 2 runs on 4.3 OS and comes with 1.2GHz GHz quad core processor & 5.25 inch screen with HD 1280×720 pixels resolution. Samsung Galaxy Grand 2 has 8 GB internal storage and 1.5 GB RAM along with 64 GB of SD card support and also 8MP rear camera with flash and 1.9MP front camera. We will see full specification of Samsung Galaxy Grand 2 with comparison to previous version Samsung Grand in this article. Previous version of Galaxy Grand had a dual-core processor and a 1 GB RAM, but Grand 2 has 15 GB Ram. Samsung Galaxy Grand 2 has a bigger display and resolution as compared to Samsung Galaxy Grand. 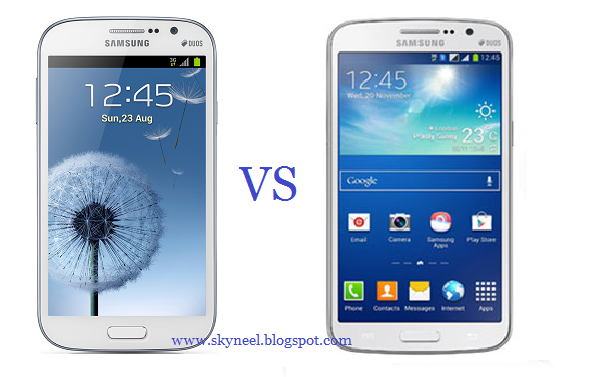 Here full comparison between Samsung Galaxy Grand 2 vs Galaxy Grand. Both Smartphone has the same processor, Dual-core 1.2 GHz Cortex-A9 processor, but these phones have diffrent GPU. Samsung Grand has Broadcom VideoCore IV GPU and Samsung Galaxy Grand 2 has 357 MHz PowerVR SGX544MP GPU. Both Smartphone has same storage 8GB ROM and user can be expanded memory up to 64GB via SD Card. Samsung Galaxy Grand comes with 5.0-inch TFT capacitive touch screen Display with 480 x 800 pixels Resolution but Samsung Galaxy Grand 2 has bigger screen size, it has 5.2-inch TFT capacitive touchscreen Display with 1280 x 720 pixels Resolution. Both Smartphone has the same 8 MP Rear Camera with 3264 x 2448 pixels, Autofocus, Geo-tagging, panorama, face detection and LED flash with 2MP front facing Camera. Samsung Galaxy Grand runs Android OS, v4.1.2 Jelly Bean and Samsung Galaxy Grand 2 runs 4.3 Android Jelly Bean. Both Smartphone has the same features like compass, Accelerometer, proximity and Maps, Calendar, Google Search, Gmail, YouTube, Google Talk, Alarm, Calculator, Clock, and other Google sync apps. Both Smartphone has the same network features, but Samsung Galaxy Grand has 2100mAh Li-ion battery and Samsung Galaxy Grand 2 has 2600mAh Li-ion battery.